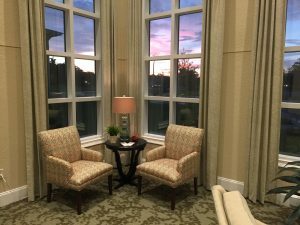 Twin Creeks Assisted Living and Memory Care in Riverview, Florida announced that they have received the final Certificate of Occupancy for the new community located at 13470 Boyette Road. Enriched Community Development, LLC, a Tampa-based developer of senior living communities worked alongside Beverly-Grant, Inc., an award-winning Construction Management firm as the general contractor that specializes in health care construction. The community broke ground in March of 2016. This 65,000 square foot facility is located near the intersection of Boyette Road and Bell Shoals Road near the FishHawk neighborhood. It will provide 80 private and companion apartments in Assisted Living and Memory Care and is equipped with a full-service commercial kitchen, dining areas, library, conservatory, game room, salon and spa, screened porches, bistros, outdoor courtyards and walking paths. Beverly-Grant, Inc. oversaw the building of Twin Creeks and is well known throughout the southeast for expertise in health care construction. “We are excited to be part of this new community in Florida, and I know the future residents are looking forward to living at Twin Creeks,” said Chris Smith, Vice President at Beverly-Grant, Inc.
Twin Creeks Assisted Living & Memory Care is expecting to welcome residents in September, once receiving licensure from the Florida Agency for Health Care Administration (ACHA). The community will be licensed for Extended Congregate Care and will allow senior residents to age in place. Monthly costs for the community start at $3250 and vary based on size and location of apartments and the type of care a resident would need. Shane Potter, LNHA, is the Executive Director at Twin Creeks Assisted Living and Memory Care and has been gathering a group of caring, expert team members to lead the community. Twin Creeks is accepting reservation deposits to secure an apartment location for the pending opening in September. Prospective residents are encouraged to inquire at www.twincreeksretire.com or call (813) 336-2128 to schedule a visit the community.